A free online course at The College is keeping healthcare professionals up-to-date on the most current medical terminology. 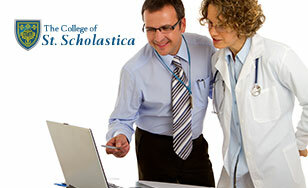 St. Scholastica is offering a massive open online course (MOOC) called Exploration of SNOMED CT Basics. SNOMED CT is a comprehensive clinical terminology used widely in medical fields. The MOOC is geared toward health care professionals, but it's free for anyone to sign up. The course has been approved for 12 continuing education units to fulfill the education requirements of the American Health Information Management Association. Taught by Mike Grove, Ph.D., an adjunct clinical professor in St. Scholastica's Health Informatics graduate program, the eight-week course will explore the basic structure and uses of SNOMED CT. Value-added instruction including lectures, self-testing assessments, exercises and resources are provided within the course. Registration is open until May 18. The course must be fully completed by June 15. For more information, visit go.css.edu/learn. St. Scholastica started its medical records program, the forerunner of HIM, as the first of its kind in the country in 1935. It has been a leader and innovator in the field ever since. "We have a long history of developing curriculum to address industry needs," said Ryan Sandefer, chairman and assistant professor for the Department of Health Informatics and Information Management. The College's annual LaTour-Eichenwald Forum on HIIM Leadership and Innovation on June 1 will celebrate the program's 80th anniversary with a panel discussion about the field's history and future.